In my ongoing quest to keep Brisbane occupied, I own, have owned, or plan to own pretty much every food-dispensing toy on the market. It's worth mentioning that the number of toys I haven't tried is definitely the minority even as manufacturers introduce new products. Admittedly the bright colors are mostly for my own benefit. dog behavior management, and Kong is a household name. Their product line is forever growing, and they recently introduced a couple of new toys that look like a lot of fun. 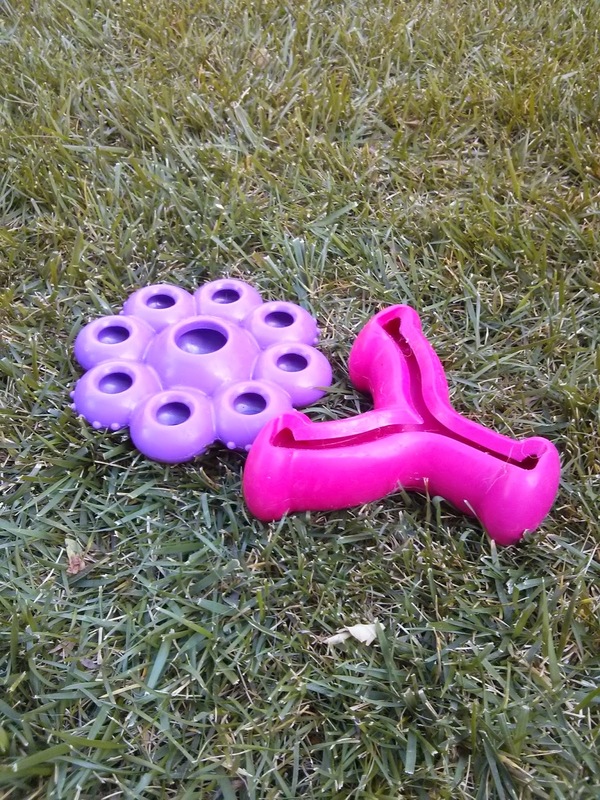 The Kong Quest Starpod comes in two sizes and several colors, I have a large purple one. The Starpod features a large central well and eight smaller satellite wells. The central well only has one opening, but the smaller circles are open on both sides. When I first spotted this toy at the store, I pondered what exactly one would cram into it. 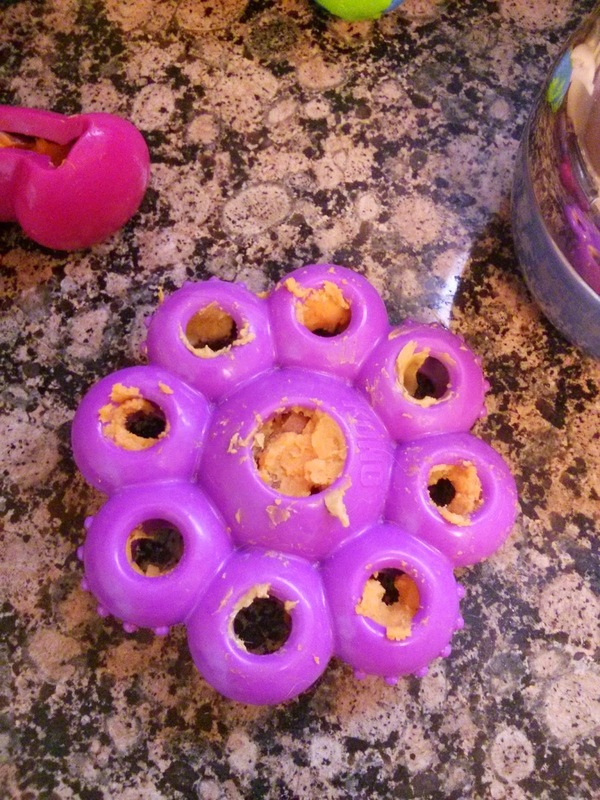 The smaller holes are way too big to contain kibble, and the big one would be emptied as soon as the toy flipped over. The Kong video shows Kong-brand treats, both soft chewy treats and the stuff that comes in the spray can. I've considered getting some Cheez-Wiz for rapidly stuffing dog toys, but my husband would probably eat it instead. Stuffed with love. And sweet potatoes. Stuffing all the little wells in the Starpod is actually kind of annoying. I usually end up using my fingers to smear stuff around the walls of the small wells and hoping it sticks. Microwaves sweet potato is a food toy staple around here because pretty much everything in the house will eat them (dogs, birds, turtles...) but Brisbane isn't madly in love with them. 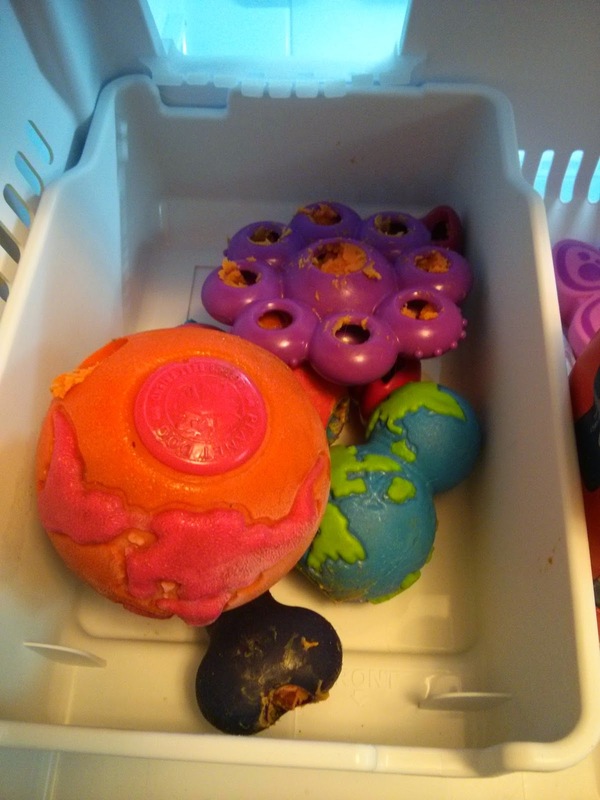 Our food toys usually end up stuffed with sweet potato, peanut butter, and occasionally leftovers. I did find that I could stuff a very specific size of biscuit into the wells of the Starpod. It has to be small enough to fit in there, and big enough not to fall out immediately. The California Natural biscuits worked pretty good when I broke them in half, but that's an awful lot of effort for something Brisbane is going to pop out nearly as fast. It may have taken Brisbane a full five minutes to figure out how to get the first one out, and maybe 15 minutes total to get them all. Doesn't everyone have a drawer of stuffed toys in their freezer? I can probably fit half a cup of squishy stuff in the big well. It takes as long to smear each little circle with peanut butter as it takes Brisbane to lick it all off if the toy is frozen first. Josie spent quite a while slurping each individual circle clean. Sometimes I am too lazy to fill this toy. It's not hard rubber, and I wouldn't give it to a recreational chewer. Comes in two sizes, and wouldn't be a choking hazard for a nondestructive large dog. Blissful silence, except for all the slurping. Might get nosed under the furniture, but it's not the type of toy that encourages nosing so it's pretty safe. I usually find it in Brisbane's livingroom lair. It would probably go through the dishwasher just fine, but I don't have a dishwasher and scrubbing all those nooks and crannies is annoying. Brisbane typically drags it away to empty it, but then ignores it. It's pretty novel, and I'm sure it amuses Brisbane to forage for peanut butter in all those little circles, but this toy sort of annoys me. Good thing it's cute. I'm pretty sure Kong designed these things to be attractive to humans more than anything else.